As the monsoon axis shifts north . TN may get rains due to the effect of LWD , as in the map the direction of LWD clearly shows ..
25mm to 50mm on average for Sun & Mon readings. AP to see an isolated T. Storm. May be Chennai has some chances of TS. Abhijit: I don't understand one thing that why the Konkan will see an increase in the rainfall activity??? Is Abhijit expecting the LWD to play a part for Mumbai ? I doubt so !! Kerala will continue to get rains. @ Emkay & Shitij. I assume Konkan to resume back with their normal on /off shower with some heavy spell because last 3days UAC in W.MP/ Guj region hampered normal rain pattern of Konkan belt especially N.Konkan region.. So as now UAC fizzling out so normal rains ( mentioned 25 -50mms ) may occur in Mumbai. Last 6 days of July Santacruz has recorded just 27.1mm. So I m just expecting 25 to 50mm for nxt 48hrs. 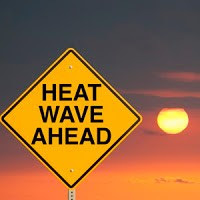 Well i think , What Abhijit has said About Konkan, will sustain as heavy rains are going on in Vasai since early morning, and the west coast trough may strengthen further from sunday onwards that means further increase in rains in Mumbai and entire north konkan belt. one more point to be noted is showers are continous here since early morning in Vasai and not on and off.medium to heavy. in addition , as the axis moves north , significant rains might be seen in north bihar and UP . @ Sam. Badlapur also had continues medium to heavy rain for 2hrs(9am to 11am today) and last night / early morning were on / off spells. Right Abhijit , what you said now is about heavy rain spell . but' what i meant was of continou's light rain going on since early morning without any break.i hope the point is clear with you. One more thing Abijit, no hard feeling's , i was not over ruling your point just making my point clear. @ Sam. No hard feeling at all .. :) Why I mentioned heavy spell instead of continous. As there will be heavy long duration spell but then will stop and will resume after gaps.. Now take current example only Badlapur 2hrs continous rain has stop at 11.30am. And after that it is cloudy now. So now next spell may resume after some gaps..
Got it right Abhijit, surprisingly Vasai is getting continous rains since morning with intermittent heavy spells.with no break at all . @ Sam. Wow nice then. Borivali also having continues rain. But santacruz only 0.5mm till 11.30am toady for last 3hrs.And 2.3mm till 8.30am today for last 24hrs. Thane 37mm, Vasai 23mm, Ulhasnagar 22mm till 8.30am today for last 24hrs. 1) Trough in the westerlies at 200 mb levels over the northern Himalayas and adjoining Tibet. 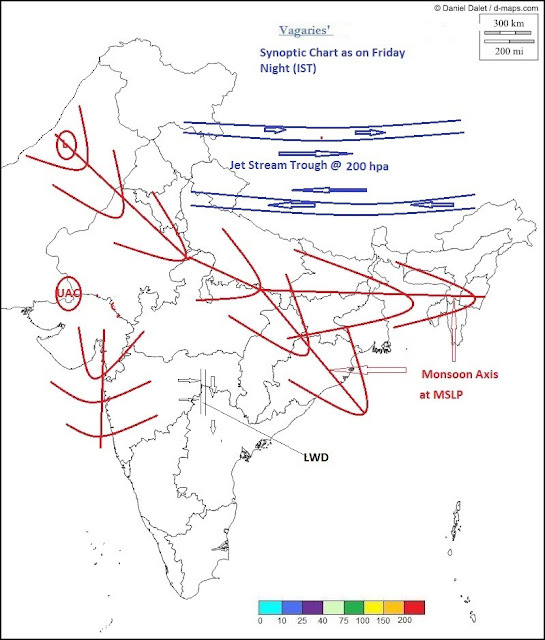 2) The monsoon axis moving north. 3) North –south LWD ( as seen in pre-monsoon) is seen in south-west Vidarbha / adjoining Marathwada and Telangana. 2) The axis is forked towards the east (as Rajesh sir had mentioned to me during ‘The MWS tutorials’..)..->Hence far eastern Assam/NMMT (Nagaland,Manipur..) may get relatively less rain than western Assam..
3) Sub Himalayan West Bengal, Sikkim and Assam get heavy rainfall .Floods may occur in Assam and Bihar due to heavy rains in the catchment areas of the rivers that flow through these regions. 4) Because of the north-south LWD, there may be scattered thunderstorms in south-west Vidarbha / adjoining Marathwada and Telangana. 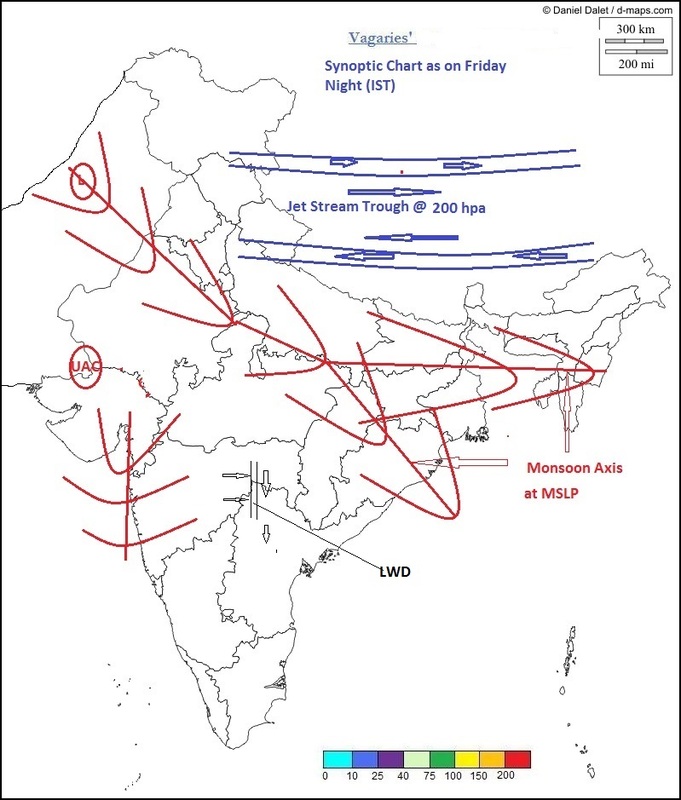 (As Rajesh sir had mentioned to me during ‘The MWS tutorials’..) -> the upper air trough also forms and enhances thunder activity after a break monsoon. The thunder activity may spread to east India and south India (Chhattisgarh,Orissa, coastal Andhra,Telangana,North Tamilnadu) ..
5) As the off shore trough persists, the west coast (south Gujarat Konkan /Goa,coastal Karnataka , kerala) get moderate rains with heavy at isolated places. 6) Central India , NW India,Gujarat remain mostly dry. Thanks Emkay/SS/Abhijit/Rohit. Your attempt at forecasting was fantastic. And i like the way you all have analysed the situation. At last, after my experimental attempted try, i am able to get forecst from budding vagarians WITHOUT REF TO ANY MODEL...yes it good. Just referring to models and forecasting is no real forecast. So, i tried this way, gave the exact situation, and from it you make an attempt..thats real forecasting. Congratulations for breaking the model trend of forecasting. And see the success today..you will really feel a sense of satisfaction ! Thank you for ur kind words Rajesh sir. But though self and Abhijit may take credit of being the first to respond, Rohit looks a true met.man wonderful report. Rajesh sir : Thanks for ur encouragement ..